I've learned to expect the unexpected with this company. After the first show I saw there (Figaro, way back in what, 2009? ), I found that it was just better to put aside any preconceptions about the show I was walking into. Scapin was no different. Adapted from Les fourberies de Scapin (literally "Scapin's Deceits) by Molière, the play is 2 hours of colorful costumes, mistaken identities, elaborate plots for money and love, and, of course, a nice long chase. It was a little different than the more period piece I was expecting. The set, designed by AJ Guban, gives the show a whimsical, Dr Seuss feel, and even comes with a dirty-minded fountain. Kendra Rai outfits the cast in bright, garish costumes (though Argante looks a little out of place - more Spanish pimp than Oompa Loompa), but they don't overpower the actors themselves. As for them, they're quite the talented crew. As the titular character, Michael Glenn leads the audience through the plot's twists and turns, cleverly winning the audience's trust with anecdotes and much breaking of that pesky fourth wall. Carlos Saldaña and Matthew McGee play father Argante and son Octave (WASPy little thing that he is) who are friends with their next door neighbors Geronte (the wonderful Ashley Ivey) and Leander (Manu Kumasi). Both sons are comically in love with girls (Megan Dominy and Nora Achrati) who are completely wrong for them (or ARE they?) and both need money to be with said girl. 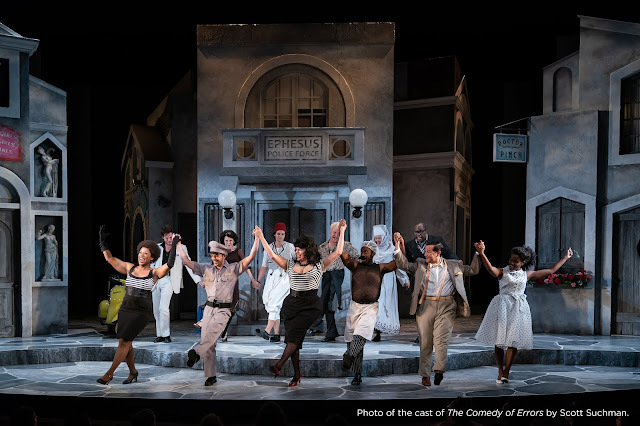 With the help of Scapin and Bradley Forster Smith's fantastic Sylvestre, everything ends happily, as well it should, in a comedy. Overall, it's a fun play. It's not perfect, there are some holes in the plot that had me scratching my head at intermission, but at the end of the night, I was very pleased I'd gotten to see the show.